It was a remarkable and unexpected display of refugee power – the power of the powerless. NICKELSDORF, AUSTRIA, Sept 5 (UNHCR) – It began at noon on September 4 with a spontaneous march out of Budapest down the highway towards the Austrian border by more than 1,000 frustrated refugees. They were marching in protest at the Hungarian government’s blanket refusal to let them take trains to Austria and Germany. It ended at dawn in the rain here at Nickelsdorf on the Austrian border the next morning. Overnight the Hungarian government had reversed its policy. Refugees spilled out of dozens of buses looking dazed, exhausted but guardedly happy. They were met by volunteers from the Austrian Red Cross and the Austrian Order of Malta holding handwritten signs saying ‘welcome’, and handing out clothes, food, water and milk, blankets and rain gear. Walid had helped organize the march that brought about what he called victory. The marchers had walked almost 25 kilometres of the 170 to the Austrian border before stopping to sleep. Then the rains came and in the midst of rain, the Hungarian buses at 2 a.m. to take them the rest of the way. She and her brothers are planning to travel to Stuttgart as soon as possible where another brother has been living for 18 months. Even after the government announcement that the buses would take all the refugees to Austria, many remained worried and unconvinced. To forestall their fears a ‘trial’ bus left before midnight with 40 men aboard. It arrived at the Austrian border at 1.30 a.m. The authorities calculated that the men would quickly phone their relatives and friends with the positive news. Some worried almost to the end. The Austrian volunteers handed out food and blankets while the refugees were still on Hungarian soil. Then they had to cross on foot in the rain into Austria to wait for buses to take them to the train station and a trip to Vienna. Gazi and Tahar are brothers, 17 and 16, from Hama. As they waited for the bus, they asked a passerby: “are we in Austria here?” They were and pronounced themselves happy, very happy. Then they asked if they would have to stay in a camp or could they go directly to their cousins living in Vienna? According to the Austrian government they will be free to find their cousins and to ask for asylum in Austria or to continue on to Germany if they wish. UNHCR applauded the decision of Austria and Germany as well as the work of civil society groups in welcoming large numbers of refugees. But UNHCR High Commissioner Antonio Guterres said that much more needed to be done. Europe, he said, was at a defining moment and must prepare to receive as many as 200,000 new refugees. In the rain at Nickelsdorf a young wife, Kawaa, took photos with her phone of her grinning husband: “We were worried at first, worried that they might take us to a camp in Hungary. Now I’m taking photos of my husband to preserve this happy moment,” she said. As the Austrian buses arrived to pick up the stream of people – as many as 4,000 – the Hungarian government insisted there would be no more mass busings. It said this singular effort had been undertaken to protect the security of its transport network. For three days Hungary had cancelled all international trains serving Western Europe to frustrate refugee attempts to leave the country. At the Keleti train station where thousands had camped for days, there were only a few families left on Saturday. But more than 2,000 new refugees arrived in the country from Serbia overnight. 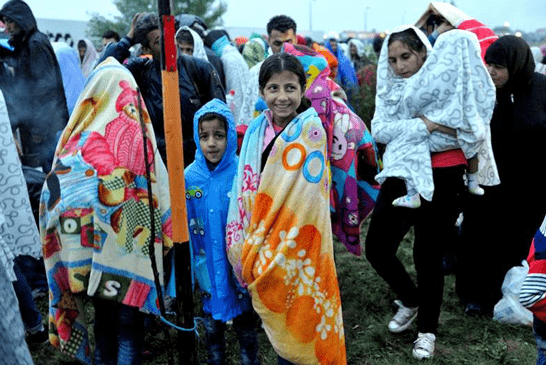 In the wet morning at the border the kilometre-long walk from the Hungarian buses to the Austrian buses became strewn with detritus – cheap foam mattresses, sleeping bags, towels, sheets, even shoes and a girl’s dress. Many of the refugees were shedding the accoutrements of a life of wandering and homelessness. They are convinced a better, stable life awaited them.